Haha! So, silly I was to think this wasn’t going to get worse. So, every year I recreate the wall (the same way, because I can get a little OCD about things) and then add the new books I’ve acquired. For those of you who saw my Dewey’s 24 Hour Read-a-Thon mini-challenge you will be prepared for my big reveal. I managed to read 25 from my stacks last year and give some more, BUT somehow I acquired (through giveaway, book sales, gifts) a net addition of 98 to my overflowing stacks. That’s a total of 837 unread books. Some of you may wonder how long it takes me to recreate these stacks every year. Because I want them in the same place they were the year before I do a few hours of prep by putting the books of each stack together, then another few hours (3 maybe) to move the books to the space. I consider this my workout for the week 🙂 I count, update my lists, take a few pictures for another 45 minutes or so. It’s always the cleanup that takes the longest, because I’m tired and do it all in a night’s time. There is no way I’d do this when Gage was awake, I’ve had stacks fall over before, although not this year. Time to fess up. How many books are you hoarding holding in your TBR piles? I don’t buy books anymore. With three boys, I no longer have time to read them. It works out well though, because I also no longer have any money to buy them. But do you have the time to write them? That is impressive/scary. My TBR pile pales in comparison. But, unlike you, I put them in different places so that it’s not so daunting. Having said that, my pile is probably 1/10 of yours! They are only on one place one night a year and then they are dispersed to 5 different bookshelves. I actually look forward to doing this every year. It makes me more conscious of the books I bring into the house! That’s good! I’d be stressed, I think. Books. Stacks of books. I’m familiar with those! 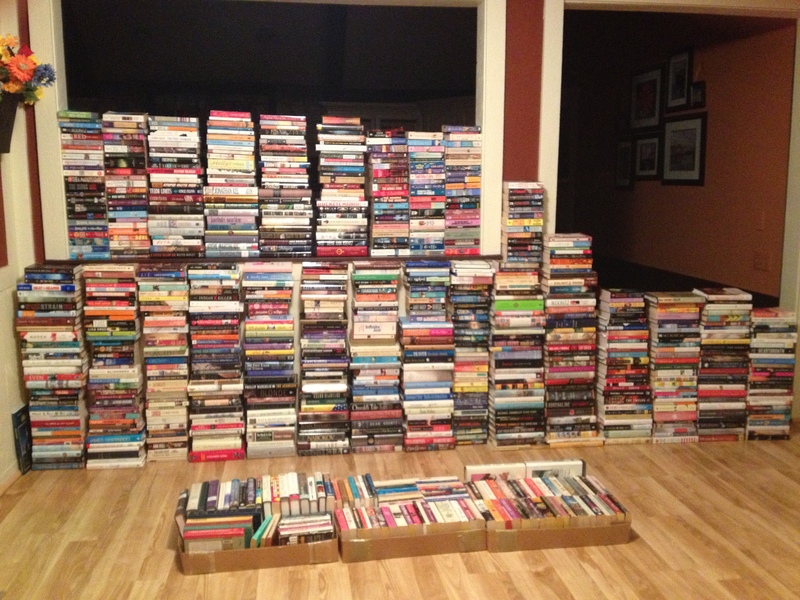 I started counting and stopped around 600 unread books, and with a few more bookshelves to go. There’s a reason I don’t stop at book sales anymore – I am officially out of space. I suppose I should do a ‘spring cleaning’ on the books. You all get a ton of books each week. I get very few, so I feel obligated to read and blog. Maybe I shouldn’t worry about it so much. By the way, I LOVE seeing this picture every year! Thanks, Tara! Every year I try to read more than I bring in and it hasn’t happened…Yet! Holy cow. That is just overwhelming now, isn’t it? I can’t tell you how many unread books I have. I don’t want to know. I’d rather stay ignorant and admire their beauty. I can firmly say though that I am not whittling them down much. Ah, yes, the books are a thing of beauty aren’t they? Gage loves to play with them AND read them so having so many around the house is a good thing. OMG!!!!! I reversed the physical book curse over the last 3 years. My physical books have gone from somewhere around 1,100 to just 400 unread books (I weeded my collected and donated all the books I knew I would never read. But….don’t congratulate me yet, my unread eBooks are somewhere near 1,000 thanks to eGalleys — yet they don’t make me feel guilty like physical book gluttony. Ummm, I’d rather not count! ;o) I am sure it is in the hundreds! I’m with Sandy, I want to admire their beauty and remain ignorant of how many are actually unread! oh wow, your TBR makes me feel so much better about mine 🙂 I have only 2 shelf’s so I try to limit my books to those, not helping though. There are 318 physical books listed at LibraryThing. This doesn’t include the ones that got listed before I started adding the TBR tag. It also doesn’t include the ones at home (15 sitting on my desk) that I haven’t listed yet. It also doesn’t include ebooks and if you add in free ebooks, I’m way in over my head. Love the picture! I hope, someday soon, to have all my tbr books gathered at home. Cool. My shelf is smaller, I think. Smaller for me abd way smaller than yours! I actually need to move the stack of read books to giveaway. Just haven’t done it yet. I rarely bring books into my home anymore. I’m so good. Okay, so I mean print books. We won’t talk about the e-books hiding on my e-reader . . . .
E-readers are a different story! I am so good with my e-reader because I rarely use it! although currently most of the books are in boxes in storage . . .it is shocking how many we end up with, isn’t it?!? Hi stranger! Long lost jenny here. Kudos for setting the books up because that alone would have me freaking! I am managing to whittle my pile books of books down to a respectable level. I give them to the library, look at some and just know I won’t read them, give those away, and stopped with the review books. My lack of blogging has probably helped too! That’s a lot of books! 🙂 I feel the same way about my pile. It’s around 600+. Luckily, I’ve given away the ones I know I won’t ever read. Um, I think I’ve told you this before, but just in case I haven’t…at last count, the fiction portion of my library was up to over 2600 books. I probably have over 1000 of non-fiction and Christmas books (yes, I have a sizable Christmas book collection). Now, all of these aren’t “to be read”…I have read many of them. I just don’t get rid of books I liked because I’m a fan of rereading. 🙂 I have been called a book hoarder (by my ex-in-laws…thank God they’re ex…I just can’t get with people who don’t ‘get’ books), but I refer to myself as an obsessive collector…and an optimist. I dream of one day having a big house with a huge built in library. I tell my boys that my books are my legacy. Luckily, I have one son who is very passionate about reading. So, you’re not alone. There are those of us who understand. And I don’t even think you’re crazy for the way you set them up each year. My books have been listed in three catalogs (I list them in a journal alphabetically by author and non-fiction by title) since I started cataloging them in 2008. That is very time consuming, but each time the journal wears out, I have to redo it. Luckily, I’m using a very sturdy one this time. I also have a blog I set up for my library (http://michelleshugelibrary.blogspot.com/). I’m hoping to start listing my books there soon (probably during the next Bloggiesta). And, of course, there’s Goodreads…I’m slowly adding my books there as well.